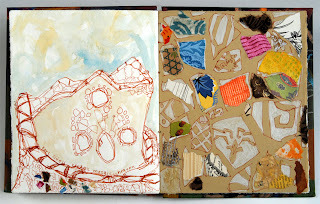 Here's a shot of the cover and inside of a book I completed at an artist residency last month, titled Home Stretch. 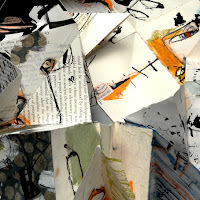 It's an artist book made of paper and altered with collage, ink, paint, and burlap. I love this little guy, it's a 3.5" square and about 28" when fully extended, chunky and funky. While it's hard to tell from the photo, this book extends like and accordion, all the pages remain connected and the imagery continues on both sides. My process starts by altering large sheets of paper with a loose theme in mind, then I trim and assemble the pieces according to what fits together best. Next I attach the pages to each other and continue to alter with varied marks until it's no longer calling out for any further action. I've been receiving wonderful feedback from my Cloth Paper Scissors article, and am hoping to share some of this knowledge at my upcoming courses. I have to admit I've been going out of my way to stop at Barnes and Noble and Border's just to peek at it in the store. There's a few spots left in my class at the Art and Soul Mixed Media retreat this October in Portland. Click here for more class information. Additionally, registration is now open for my fall seven-week sketchbook course at the Corcoran College of Art and Design. Click here for more class information. One of the things we'll be doing in both classes is experimenting with combinations of collage and drawing like the image pictured here. These pages are from the sketchbook I kept in Barcelona earlier this spring. 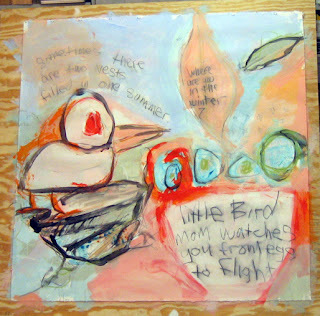 This page includes ink, watercolor, collage and colored pencil. I used a combination of found papers, altered papers, and hand made papers to describe the variety in the color and texture. It's a detail of Parc Guell in the northern part of the city. The architect Antoni Gaudi, based many of his his building forms based on natural forms: plants, seeds, pods, sea creatures, etc. Because he included these organic shapes within his structures, and flat tiles were not going to get the job done, he was forced to be one of the first to recycle. This structure is literally curved and covered from top to bottom with bits of fabulously colorful spanish tile. Eye Candy. I've just had three prints acquired by the DC Commission on the Arts and Humanities. And I'm thrilled! After the Artomatic show wrapped up in the spring I received a letter from the commission requesting an application for their art bank collection. They accepted all three prints. I'm looking forward to finding out more details about where they will be placed. Artwork in the art bank collection is loaned to other government agencies in DC and on display in public areas. Perfect! I can't ask for more than having the work displayed for many to see and enjoy. 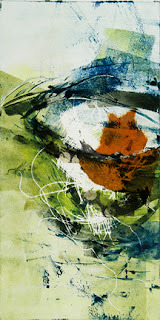 The series of prints they selected are monotypes with loads of collage integrated into the surface. The one pictured here is titled Awake. While it's 3 less prints for me to display at the Torpedo Factory in the Printmakers inc. studio I'm happy to make more. Currently, the show in our studio highlights another monotype series I created, along with a group of artwork by Torpedo Factory artists who work in mediums other than print. (painting, sculpture, etc.) The Artists choose Artists show opens Sunday, July 29th, from 3-5, hope you can join us. 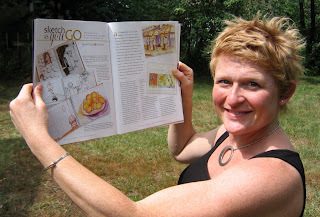 My long awaited article on keeping a sketchbook while you travel is now out in the July August, volume 13, issue of Cloth Paper Scissors! I've got three spreads starting on page 56 (not that I have it memorized or anything). The article features my sketchbooks from France and Italy, along with an article and tips on how to get started and recommended materials. Check it out!!! This is my first article but not my last. You can click here to view the current issue, and link to the table of contents, but will need to get to a bookstore to view the real thing. I'd especially like to thank Lesley Riley. This fellow collage book artist guru - was nice enough to say yes when I called her out of the blue over a year ago and asked if she would mind taking a peek at my sketchbooks and giving me some feedback. Often artists are hesitant to share information, or offer suggestions, but not this hip chic. My, my, how a little positive reinforcement can go such a long way. Merci Lesley. 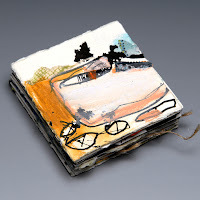 If you'd like to find out more about my sketchbooks, artwork, or upcoming classes please go to my web site at mphackmann.com. I'll be posting more books and paintings in the next few months as I get ready to teach at the Art and Soul retreat this October in Portland, Oregon. Collaborate - exchange - and share - that's what we did at Shakerag. Here try this. Wanna swap collage pieces? Wanna see how I made this? Can I borrow a bone folder? Here we're in a book class with Dolph Smith, selecting book signatures created by our classmates. We were instructed not to select our own work, then we were asked to describe what what we liked about the pieces we selected. The powerful part of this exercise is that as the creator of the pieces we were asked to be silent and soak in the feedback on how the work was received not share how it was produced, or comment. (difficult for me, as you can imaging) Very enlightening. It showed me that everything is open to endless interpretation, regardless of how straight forward I think it is. Now onto some painting.... My quest was to include forms that one could identify into my work. This should be a reasonable request. But as you'll see (as I post more work from the week) I'm full of abstract forms. I just can't help myself once I get rolling with the color and texture party. This piece is 42" x 42". Why not say it big? Mom watches you from egg to flight. While many assumed this was about moi, it's about my mom. Yes she is a closet ornithologist and stalks those little birds (quite carefully of course) the moment the nest shows any signs of activity. I wonder how many nests she's had this year? Even I find it to be endless fascination too. It's big - it's bold - it's birdy - I love it. While it's difficult to see in this shot there are many hidden, smaller and recognizable forms sprinkled throughout. Detail to come.